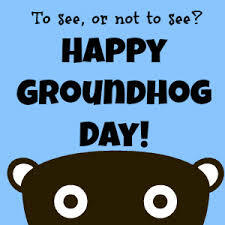 February 2: it’s Groundhog Day! Did Punxsutawney Phil see his shadow or not? Will there be 6 more weeks of winter? Why are we taking meteorological advice from a rodent? This entry was posted in Uncategorized. Share link: http://www.edvalentine.com/my-groundhog-day-challenge-to-you-and-me/. Follow comments with the RSS feed. Post a comment or leave a trackback: Trackback URL.